uuid : 39739381-05bd-4605-b9e7-8475da49a6e5 templates_id: 119547 templates_uuid: "ed9a1cb3-d983-4a14-aa53-1ce4c43b9c12" title: "Free NDA - Non Disclosure And Confidentiality Agreement" display_name: "Confidentiality agreement " meta_keywords: "Non-disclosure agreement, NDA and Non disclosure contract" description: "
Preserve confidentiality when two businesses exchange commercially sensitive information by using this mutual confidentiality agreement. This two-way non-disclosure agreement (NDA) offers protection when two businesses want to share information with each other but need to make sure that the information goes no further. This mutual NDA allows you to get to know each other better so you can decide whether to enter into a longer-term deal or partnership. A confidentiality agreement (also known as non-disclosure agreement) is a legal contract that offers protection where two or more parties will be disclosing confidential information to each other. Asking the other party in these situations to sign an NDA protects any sensitive information you may share. An NDA protects this information by stating that anything confidential that is shared between the parties will not be shared with others (except in prescribed circumstances) and if it is shared, then there will be reparations eg damages. What type of information may be protected? Almost any type of information can be confidential information. You can protect both commercial information and personal information. Examples of confidential information include trade secrets, patents, products designs, data bases, recipes, drawings, client\302\222s information or lists etc. What is \302\221the purpose of disclosure\302\222 in a confidentiality agreement? When drafting a confidentiality agreement you must state the purpose of the creating the NDA (the disclosure) to the other party. This is also called the \302\221permitted purpose\302\222. The purpose of disclosing the information must be legitimate and for specific reasons. You must describe the purpose of disclosure as clearly as possible, eg for the purposes of exploring a joint venture between the parties. When is information not considered to be confidential? When will a confidentiality agreement end? The period of time for which each party must keep the information confidential will vary depending on the circumstances. Confidentiality agreements can be terminated immediately by giving notice in writing or can automatically terminate (after 1, 3 or 5 years if creating a Rocket Lawyer NDA). You should set a realistic time period for the duration of the agreement as information can lose its confidential character or commercial value over time. What are the remedies available for breach of confidential information? The remedies available for breaching a confidentiality agreement are proportionate to the wrong done. A successful claimant in an action for misuse of confidential information is entitled to a percentage of profits that have resulted from the misuse of information, damages and, or an injunction. This confidentiality agreement is governed by the law of England and Wales.
" created_timestamp: "2018-10-08 04:36:50.0" modified_timestamp: "2018-10-08 04:36:50.0" active: true created_by: 236 modified_by: 236 dcm_id: 40 url_slug: "Confidentiality-agreement" meta_description: "Make a free NDA agreement using our step-by-step interview. Make your non disclosure agreement online today with our free non-disclosure agreement template. Protect confidential information shared between two parties with this free confidentiality agreement." time_to_complete: "10 minutes" role1: "First business sharing information" role2: "Second business sharing information"
Almost any type of information can be confidential information. You can protect both commercial information and personal information. Examples of confidential information include trade secrets, patents, products designs, data bases, recipes, drawings, clients information or lists etc. What is the purpose of disclosure in a confidentiality agreement? When drafting a confidentiality agreement you must state the purpose of the creating the NDA (the disclosure) to the other party. This is also called the permitted purpose. The purpose of disclosing the information must be legitimate and for specific reasons. You must describe the purpose of disclosure as clearly as possible, eg for the purposes of exploring a joint venture between the parties. More than just a Confidentiality agreement template, our step-by-step interview and guidance makes it easy to create your document. 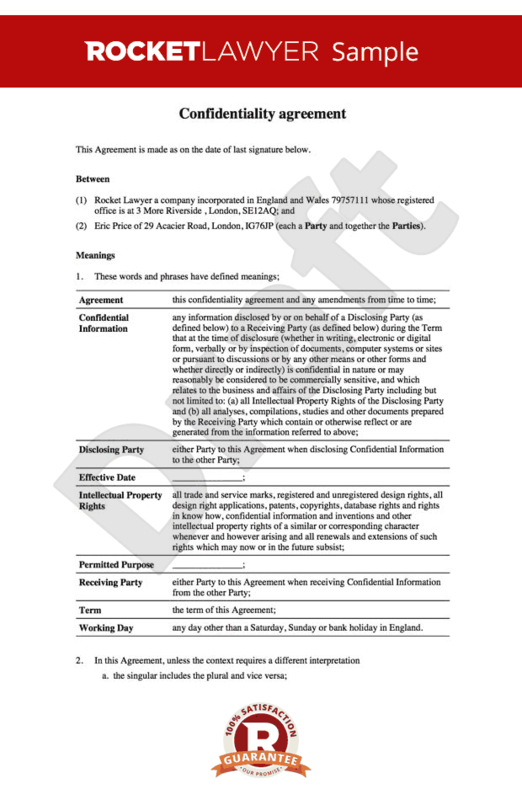 Easily create online, download, print and sign your free Confidentiality agreement in minutes. This document is also sometimes called: Non-disclosure agreement, NDA and Non disclosure contract.